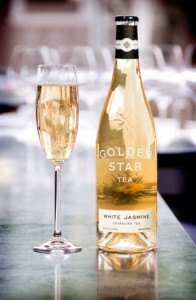 There will be no whining from the designated drivers if you have Golden Star’s White Jasmine Sparkling Tea on hand. I first discovered this boutique beverage at last year’s Fancy Food Show and had chosen it as one of the year’s best new products. It’s taken a while, but it’s finally available at Whole Foods in San Francisco, L.A. and New York, or online. sparkling tea that can be sipped like champagne.